Spray 5-quart oval slow cooker with cooking spray. 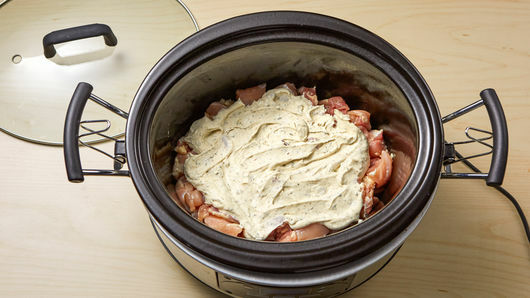 Place chicken in slow cooker. In small bowl, mix whipping cream, flour, gravy mix, poultry seasoning and salt; pour over chicken. Cover; cook on Low heat setting 3 to 4 hours or until chicken is no longer pink in center. Heat oven to 350°F. Stir thawed mixed vegetables into slow cooker. Cover and cook 15 to 20 minutes or until hot. Remove slow cooker insert. Separate dough into 8 biscuits. Top mixture in slow cooker with biscuits. Bake uncovered 35 to 40 minutes or until biscuits are deep golden brown on top and cooked through. Size matters! We tested this recipe in smaller slow cookers, and while the chicken mixture works fine, the biscuits don’t get done. To make this in a smaller slow cooker, bake biscuits separately as directed on can. Don’t forget to preheat your oven about 15 minutes before you want to bake the biscuits on top of the hot stew. 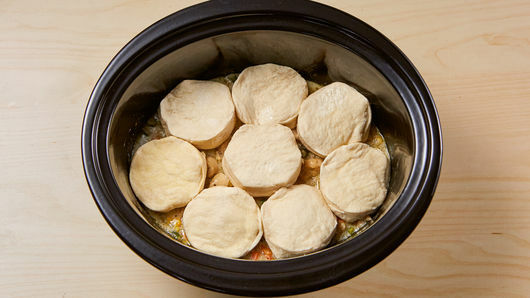 Did you know that most removable slow-cooker inserts are actually ovenproof? Top with biscuits, and pop it in the oven for an easy finish. If yours is not ovenproof, bake biscuits separately as directed on can. 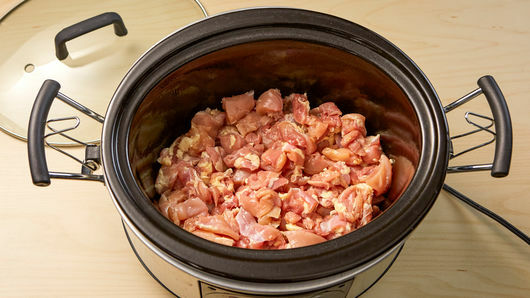 Cooking the chicken in the slow cooker with the sauce tastes good alone, but for more savory flavor, add 2 cups diced onions to the chicken misture before adding to the slow cooker. Crock pot chicken pot pie? Yes, it can be done! Traditional chicken pot pie is usually baked in the oven and topped with a flaky pie crust (and we have an awesome recipe for it) but sometimes an old classic needs a new spin. This easy chicken pot pie recipe that’s made in the slow cooker has the same characteristics of traditional pot pie—creamy, comforting and hearty—but is even easier to make. 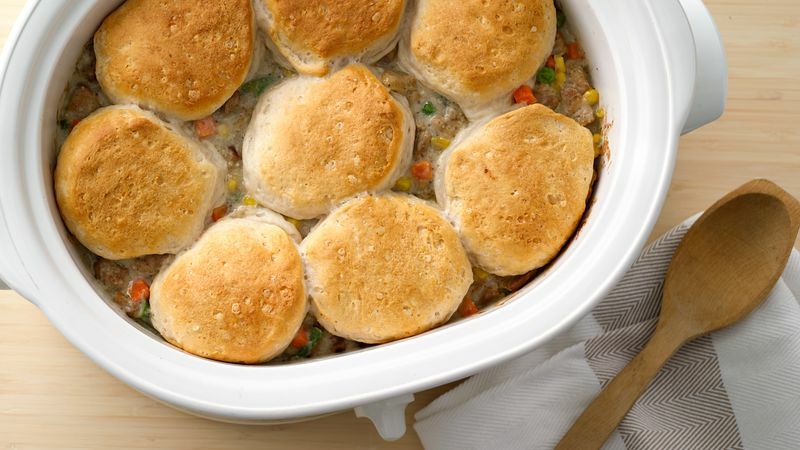 Plus, it gets topped with golden Pillsbury biscuits instead of pie crust, making it easy to scoop and serve without losing that dough-topped component that has made pot pie a famous all-in-one meal. 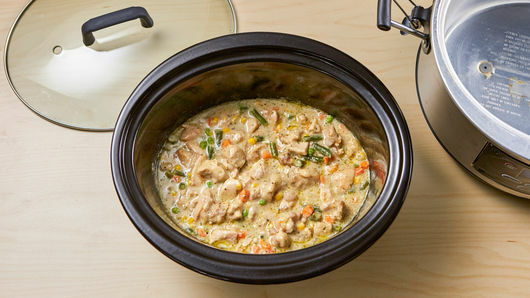 Get more easy slow-cooker chicken recipes like this one by browsing our huge collection, or learn how to cook an entire chicken in the slow cooker by reading this article.